As a life-long railfan, I love passenger trains. But as a transportation economist, I hate subsidies for the way they dilute productivity and transfer wealth from the many to the few. Thus, I am a reluctant opponent of subsidies to Amtrak and urban rail transit. 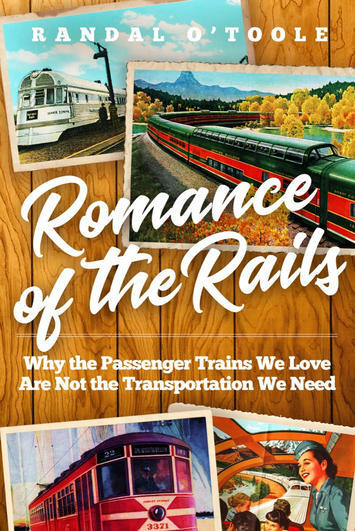 Romance of the Rails, a new book that the Cato Institute will publish in October, is my attempt to reconcile these views by looking deep into the history of passenger rail transportation. Rail lovers look back with nostalgia at the Golden Age of passenger trains, roughly 1895 to 1925, when thousands of passenger trains connected every part of America and streetcars rumbled through every city of more than 15,000 people. What few see is that streetcars and trains were and are so expensive that they were mainly used by the elites and offered little mobility for the average American. In 1920, at the height of the Golden Age, Americans traveled an average of 1,200 miles a year in streetcars and trains, compared with 17,000 miles a year today by automobiles and planes. But while automobiles are relatively egalitarian, most Americans in 1920 rarely, if ever, rode streetcars or trains. The Golden Age was made possible only by a unique confluence of events that will never be repeated. Many of the key technologies that enabled the Golden Age were invented by one man, Frank Sprague, who deserves to be called the Tesla of transportation. In the late nineteenth century, most urban jobs were in factories and most factories were in downtowns. But getting people to the jobs was a problem. In 1888, Sprague developed the first workable electric streetcar, and within 15 years more than a thousand American cities had installed such streetcars. In 1892, Sprague developed the first high-speed electric elevator, enabling high-rise construction that packed even more jobs into major downtowns. In 1898, Sprague developed the first electric rapid transit lines capable of bringing large numbers of workers into those high-rise downtowns. In 1918, Sprague also invented positive train control. Thus, Sprague is largely responsible for the growth of the monocentric city in which most jobs were located at the hub of a number of rail transit spokes. But even in the early twentieth century, most factory workers were unable to afford to ride rail transit, so they and their families lived in tenements within walking distance of their jobs. Everything changed in 1913 when Henry Ford developed the moving assembly line for making Model Ts. As is well known, the efficiency of the moving assembly line enabled Ford and other manufacturers who followed him to increase worker pay and reduce the price of their products, thus granting to even unskilled workers the mobility once enjoyed only by the very wealthy. Less well known, and more important to rail transit, is the fact that moving assembly lines required lots of land, so factories moved the suburbs, bringing about the end of the monocentric city and rail transit’s preeminence. Early buses, such as the 1923 Safety Bus developed by a family of brothers named Fageol, cost less than streetcars, so as transit companies extended lines into the suburbs after 1920, they used buses rather than rail. But those buses cost more to operate per passenger mile than streetcars, so initially there was little motivation to convert streetcars to buses. In 1927, however, the Fageol brothers introduced the Twin Coach, the first bus that cost less to operate than streetcars. By this time, most streetcar lines were near the end of their expected 30-year lifespans, so hundreds of transit companies began scrapping streetcars and replacing them with buses. At about the same time, Great Northern Railway president Ralph Budd realized that buses worked better than intercity passenger trains for short trips. So the Great Northern bought a Minnesota bus company, Northland Transportation, and gave the company funds buy out scores of other bus companies. One of the companies Northland bought used a running dog as its logo, and soon Northland changed its name to Greyhound. In the 1930s, as president of the Chicago, Burlington & Quincy Railroad, Budd helped start National Trailways Lines. Thus, a railroad president could justly be said to be godfather of America’s intercity bus industry. Budd still believed passenger trains could be competitive over medium and long-distance routes, but the automobile in the 1920s and the Depression in the 1930s had decimated intercity passenger trains. In 1933, Budd attended Chicago’s Century of Progress Fair, where various manufacturers exhibited new products and ideas including diesel engines, stainless steel, air conditioning, and streamlining. Budd put these ideas together and had the Burlington introduce the world’s first diesel-powered streamlined passenger train in 1934. The erudite Budd named these trains zephyrs after the god of the west wind. In the 1930s, Zephyrs and other streamlined trains revitalized intercity passenger rail because they were faster and more comfortable than the steam-powered trains that preceded them. But they were unable to compete against commercial airliners in the 1950s. By 1958 ridership had declined so much that the Interstate Commerce Commission predicted that passenger trains would disappear by 1970. Congress responded by offering the railroads a simplified process for cancelling interstate passenger trains. This created the “commuter crisis” when railroads proposed to use this process to cancel interstate commuter trains serving New York, Chicago, Philadelphia, and Boston. To rectify this, Congress in 1964 offered federal subsidies to states and regions that took over commuter trains. Politically, Congress couldn’t pass a law that helped just four cities, so it offered similar subsidies to all public transit agencies. Within a decade, the transit industry that had been mostly private was nearly all municipalized. By that time, rail transit survived in just eight urban areas, and initially transit agencies elsewhere were content to run buses. But government’s desire to spend money won out over any effort to be efficient, and today well over 40 urban areas have rail transit lines, most of which could be operated more efficiently with buses. Amtrak resulted from a similar accident of history. In the 1960s, a passenger train advocate named Anthony Haswell believe that a true national system of passenger trains could be profitable, and lobbied Congress for the federal government to take over passenger trains. Nothing happened until 1970, when the Penn Central Railroad went bankrupt. Though the company failed because of poor management and industrial decline, railroaders convinced Congress that money-losing passenger trains were at fault, so within four months of the bankruptcy, Congress passed legislation creating Amtrak. Today, taxpayers spend nearly $25 billion a year subsidizing rail transit and Amtrak. Counting all subsidies, urban rail transit costs about four times per passenger mile as much as driving and intercity passenger trains cost about four times as much as flying. Cost is just one of rail’s disadvantages. Offering door-to-door service, cars are far more convenient, while planes are considerably faster than the fastest high-speed trains. No one would propose a multi-billion-dollar program to save slide rulers from the pocket calculator industry or to save manual typewriters from word processing computers. So, concludes Romance of the Rails, it is time to stop subsidizing the passenger rail industry.